Wallpapering Fog: There are ads on the web? Really? Edit: I've updated the guesstimates in this post here. Google has announced that it is to start serving ads to its users based on their browsing habits. The original web ad-blockers left pages looking nasty. They didn't load the ads (sometimes) but left big spaces where they were supposed to be. Adblock Plus is cleverer, it removes the ad completely and your browser rearranges the page around it. Adblock's not perfect. It's amazing to use Firefox for a while and wonder why a site is only bothering to use half the screen. My personal favourite is the Football365 Mailbox, about which I genuinely wondered for some time why it only put the content in a half screen column, before loading the same site in Explorer and seeing - and waiting for - tons of clutter on the right side of the screen. The Google story set me wondering how many other people in the UK are using this tool. Are you? Adblock Plus is running at 6.6m daily active users. 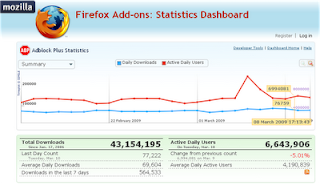 There are approximately 50m daily active users for Firefox worldwide, which gives a penetration for Adblock of 13%. Indolent reports a UK Firefox penetration of 17.2% - lagging behind the rest of Europe. That's low enough for advertisers to safely ignore for now. Turns out I'm a bit of a technology geek for having it installed. Definitely worth keeping an eye on that penetration figure though. Mozilla could, if they wanted to, market a 'no ads on the web - ever!' version of Firefox with Adblock pre-installed, but I'm guessing they know how popular that would make them with the people who fund a large slice of their business. As for me, I'm quite enjoying a web with no ads, free-riding off everybody else who is funding the websites I read. If you've just learned that Adblock Plus exists, please, for the sake of we 2.2%, don't tell anyone.